Gantries are any of various spanning frameworks, as a bridgelike portion of certain cranes. 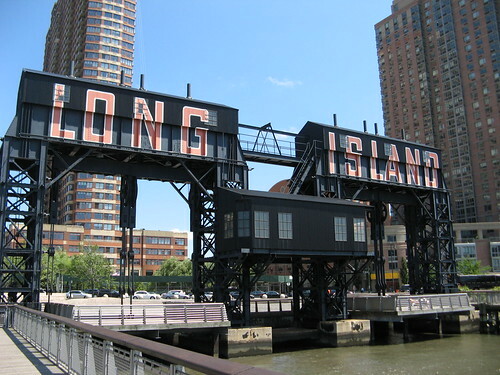 When they developed this beautiful park they left the gantries which were used when Long Island City was a port for New York City. To the left is a lovely park for sunning and tanning and I'm taking the photo from a long pier that looks out on the East River and the NYC skyline. nycskyline 005, originally uploaded by theteach1166. Excellent, Mary. I love it when you take us on tour with you! I learned something and I enjoyed the view. I'm visiting NYC vicariously through you. You know that, right? I'm surprised you're out and about...aren't you guys having a heat wave? Oh, you probably took this another time. Stay cool teach! You did a great job with that shot. The composition is great and a very interesting post. You take some of the most interesting pictures love. It is not back to school time yet, that will be the last week of August, but it is time when all the sales happen. This is great, It's areal ststaement photo, the wording as you approach just hits you head on. fabulous shot. Lovely post. THANk you! i wouldn't see NY. if i wasn't for you! That is really quite stunning! I too am seeing Newq York for the fiurst time via your camera! Well done!